Digital label printing combines design flexibility with significant production cost savings. The use of digital software not only eliminates the time and costs associated with the production of printing plates but also allows changes to be made to the label design at little or no additional cost. This is ideal for prototypes or small runs, as it enables customers to adjust their labeling as needed as their products evolve. It is also ideal for promotional labels for holidays or special events, as clients can produce labeling in virtually any volume without the initial investment required by conventional printing. Customers can save when ordering multiple versions of the same label size and material by taking advantage of our “Versions” option. into one unit, giving you a price break based on the total quantity. You read that right! You can print entirely different artwork on each “lot” and combine those versions into one order, to get a much lower price. In order to qualify, versions must be printed on the same material with the same options (size, shape, laminate/varnish). With digital label printing, customers have the highest level of control over the labels they produce, saving both their budget and resources. Additionally, by increasing the economic viability of short and medium print runs, digital printing produces less overall waste, which helps clients to supplement their cost savings with a more sustainable printing process. In fact, digital label printing allows us to consider the environment during every step of the production cycle. Digital presses can print on environmentally certified media, such as 100% recycled substrate, and are compatible with environmentally safe adhesives, primers, and biodegradable substrates. While small print runs rely heavily on digital label printing, our broader digital capabilities are growing all the time. 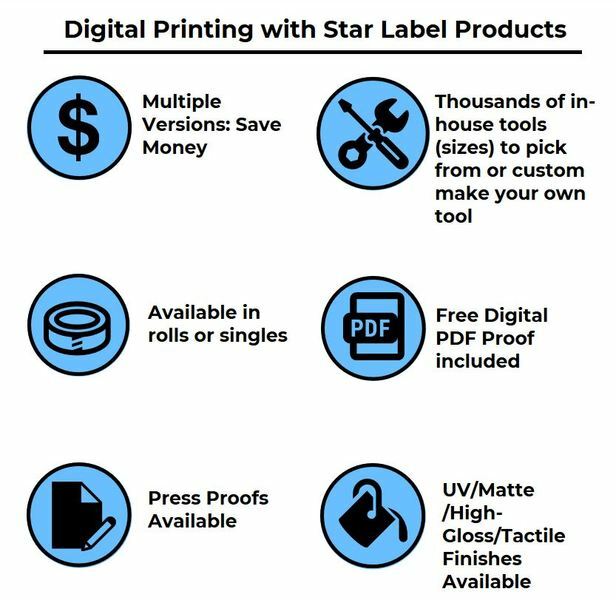 We have multiple HP Indigo digital presses, which provide our customers with a fast turnaround and ensure that Star Label Products will deliver your labels on time! Both digital presses are capable of print runs that are faster than ever before. Longer production runs that were once taken on almost exclusively by conventional printing methods can now be handled solely through digital processes. This has allowed for expanded savings and flexibility for all varieties of customers — from food and beverage or pharmaceutical clients to cosmetics or appliance manufacturers. Hot Foil Stamping — Stamping allows us to add shining, reflective foil to labels that give off an eye-catching, high-end look. Flat Bed Screen Printing — With this method, we can apply a tactile coating that is known to attract consumers to examine the label’s texture. Screen printing also allows us to print opaque colors on clear substrates for the no label look. Specialty Laminates & Varnishes — We are able to provide visually stunning and interactive packaging for customers who want extra “shelf-appeal”. Sheeting — We have a sheeting station that produces single labels or sheets of labels instead of rolls, allowing customers to receive their products in whatever form they require. Cold Foil Stamping — By using this technique, we can add a second foil to the label, creating impressive designs and visual effects. Advanced Hybrid Spot Color Flexo Printing — For customers with advanced color matching needs, this technique matches the exact Pantone, metallic, pastel, or pearlescent colors that our clients require. Flat Bed Embossing — Provides raised areas on labels that attract the eye and touch of potential customers.